What to game then? 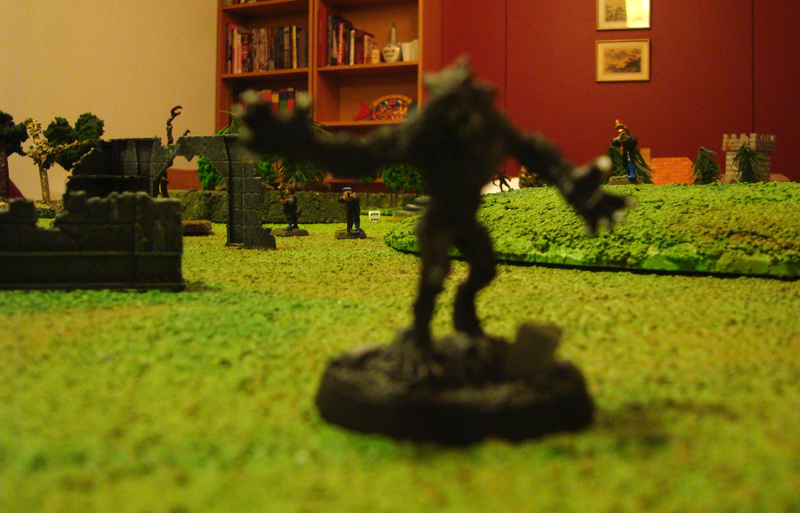 I still had my WHFB Empire minis on the table, so I decided to go for some traditional horror: a werewolf terrorizing a small village. 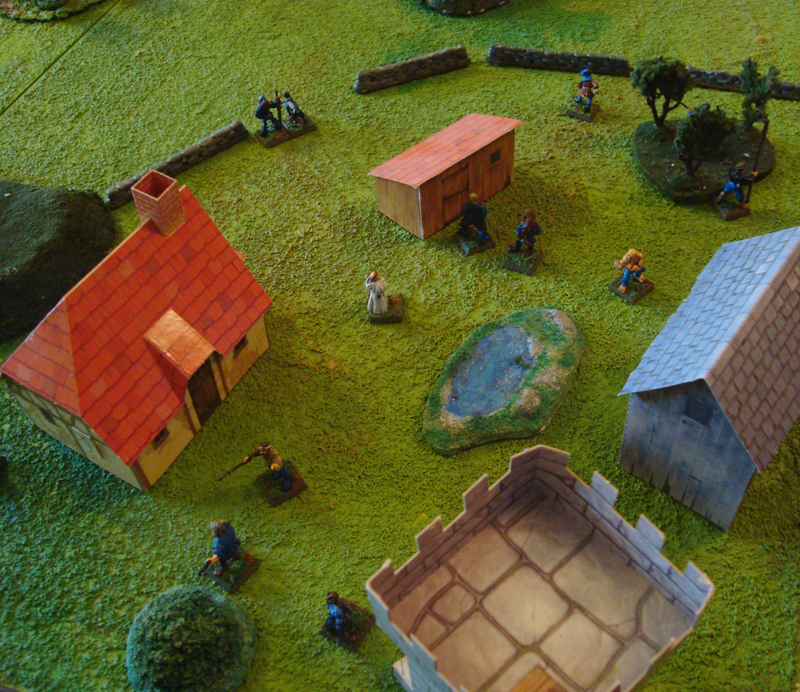 What started out as one scenario turned into a three-game mini campaign. A friend came over the play and the game was on. Since I game fairly rarely, I figured it would be fun to jot down what happened. The objective in the first scenario was for the werewolf to enter the village, capture the priest and take him back to the mystical, ancient ruins to transform into another werewolf. The villagers’ objective was to get inside a big stone tower and hide there. The priest could only start moving once contact with the werewolf was made. As this was the first game we played, we took some time to get the feel of the rules, but got the game rolling nicely. The weather rolls brought a thick fog upon the landscape, reducing visibility to almost zero. As a wolf howled in the distance, the villagers started to get nervous, many of them shuffling towards the safety of the tower. Many villagers remained fairly ignorant, though, especially a few workers in a nearby orchard who kept on picking fruit for the whole scenario. As the werewolf neared the village, the village gatekeeper’s dog darted off into the fog, barking. The gatekeeper shuffled behind him, but quickly lost sight of his faithful hound in the thick fog. Meanwhile, the rapidly moving werewolf managed to evade the dog. Almost out of nowhere, the werewolf struck. It leapt over the low village wall, and chased one of the villagers – delirious with fear – towards the tower, before turning towards the surprised priest. The villagers darted this way and that, while the priest desperately tried to evade the huge monster. It was to no avail, and the werewolf swatted him down, picked him up and started to move out of the village. The villagers were no warriors, most still trying to get to the safety of the tower or milling about aimlessly. Hearing that something was wrong at the village, the gatekeeper and his dog returned to the gate to face the beast. In a heroic moment, one of the villagers ran up and grabbed the priest’s cassock, pulling with all his strength. This surprised the werewolf completely, and it stumbled to the ground, dropping the priest. The stunned priest barely got to his feet however, when the werewolf struck him again. The priest again falling unconscious, the werewolf tore the poor heroic villager to ribbons and headed for the gate, only to find itself staring in the eyes of the gatekeeper’s watchdog. Unfortunately for the dog it was a no-contest, and the werewolf ripped the dog apart in short order, causing the gatekeeper not only to flee, but also fall into a deep gloom and lose all heart as his faithful companion was killed. With the gatekeeper and his dog out of the way, there really was no-one left to stop the attacker, and the werewolf loped into the woods carrying the captured priest. Scenario #2 – To the rescue! The villagers certainly couldn’t leave their spiritual shepherd in the clutches of an ungodly beast. A team of five hunters – sadly not present at the raid – went after the creature to try and bring back the priest. 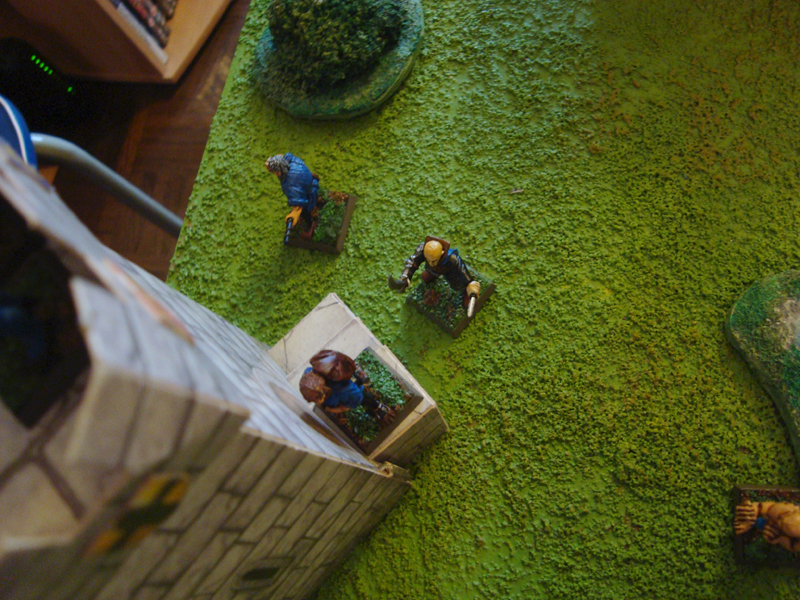 The objective for the hunters was simply to bring the priest back inside the village walls, while the werewolf tried to stop them. Bad luck was with the hunters from the beginning. Not only was it raining (which was impairing their vision and wetting their bowstrings), but they had barely reached the priest who was lying unconscious in an old stone circle, when night fell and a bloodcurdling howl sounded from the ruins close by. Very close by. The werewolf charged the first hunter to reach the priest, who hastily scampered to safety behind the large standing stones. 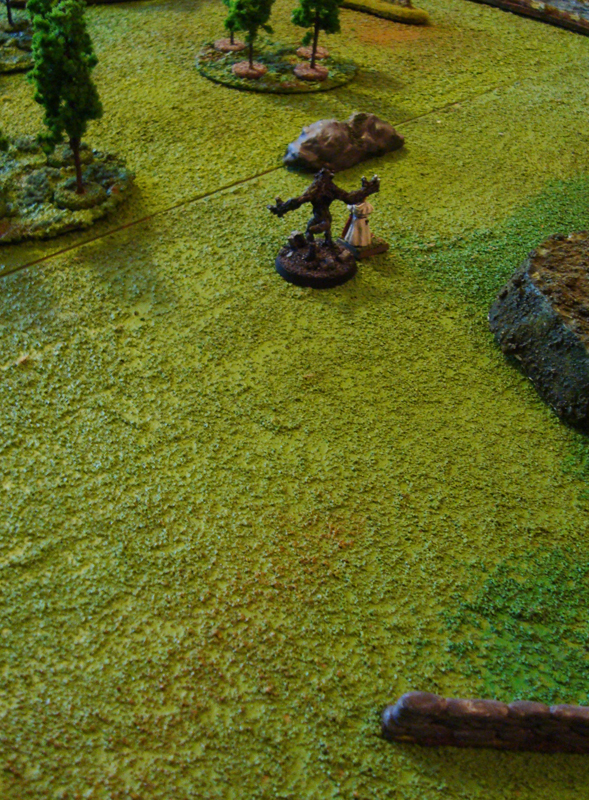 Another hunter loosed an arrow which whistled harmlessly past the werewolf. One of the hunters bravely faced the beast, which charged at him full tilt. Another hunter joined the fray, and the woodsmen managed to overpower the beast for a moment, bringing it down to the ground. Lacking silver weapons, however, this was the best they could do, so the other hunter broke off to help with the priest. In the meantime one of the hunters picked up the priest and started carrying him to safety. The two remaining hunters watched on from further away, unsure of what to do. The werewolf recovered quickly in the combat, and summarily tore apart the hunter pestering him, causing the two others helping the priest to cower in fear. In fact, one of the two stumbled away in his panic and fell to the wet forest floor. A third hunter witnessing the slaying went into shock. He ran away for a bit and then simply froze in place, not daring to move. Almost leisurely the werewolf went after the fallen hunter, while the other one composed himself and resumed dragging the priest to safety. The two hunters further away finally sprang into action, with one of them making a quick sprint towards his friend carrying the priest and loosing an arrow at the beast. His aim was off, though, and the arrow hit a tree trunk far beyond the wolf. The fallen hunter scrambled to his feet, just in time to see the werewolf’s claws rend him to pieces. Luckily the other hunters weren’t close enough to see the disturbing sight. With two hunters down, the werewolf ignored the priest and his helpers for the time being, and hungrily tore into the shocked hunter, who simply stared as the slavering beast charged him. As the two remaining hunters carried the priest through a small thicket of trees, they heard another horrible scream behind them. 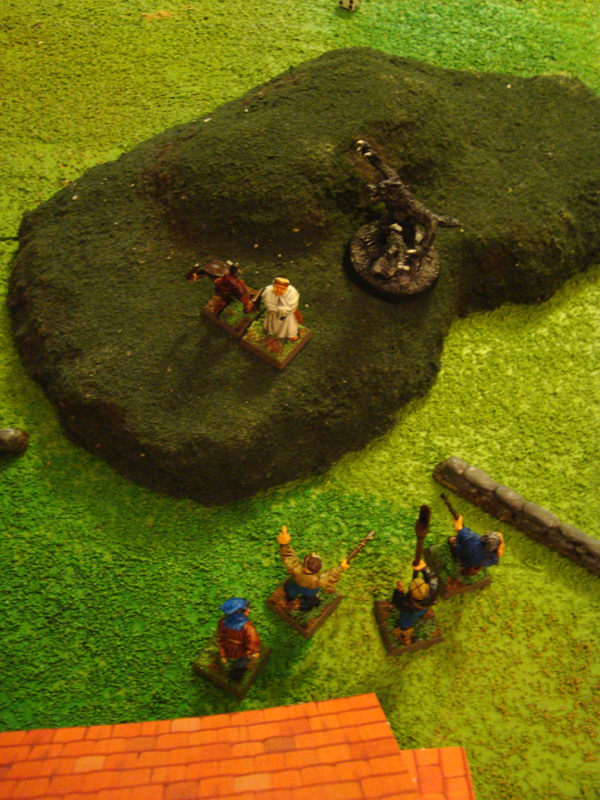 Of course, the werewolf wasn’t too far behind, and charged one of the hunters, chasing him off the priest. As the remaining rescuer shuffled on with the priest, his friend threw himself between them and the beast, buying some time before he met the same fate as all the other hunters attacked by the werewolf. His sacrifice was not in vain, though, since what followed was an amazingly unfair running contest between the hunter carrying a priest and the slavering werewolf. What was even more amazing was the fact that the hunter won, due to some crazy dicerolling. The werewolf only inches away (both rules and story wise), the tired hunted cleared the village wall and the villagers chased off the beast with burning brands, pitchforks and other assorted mob tools. The priest was safe and there wouldn’t be another werewolf joining the party. Against all odds the hunter and the priest make it back! The beleaguered villagers sent a messenger to their king, complaining about a vicious beast causing all sorts of havoc. The king responded by sending his royal hunters: the hunt master with silver bullets, two of his apprentices with muskets and a mounted pistolier. They were to bring the beast down and bring peace to the land. The scenario was simple: the werewolf tried to get from one board edge to the opposite one, while the hunters tried to kill it. Again luck was with the werewolf. Night fell quickly, hampering vision. What followed was a fairly lacklustre effort by the celebrated royal hunters, as their shots flew wide in the dark forest. The werewolf was simply too fast for even the mounted pistolier to catch, and even the hunt master with his silver bullets failed to hit his target. In the end the werewolf escaped all too easily, chased by the shots of the hunters. All in all a victory for everyone concerned, as the werewolf escaped with his life, the villagers and their priest were left to live in peace and the hunters could report to the king that the beast had been driven away. And that’s it, our mini-campaign finished. My impressions of the games were excellent. Fear and Faith works very well as a scenario-based game, and the game mechanic is very light and speedy. What was most important for me in this game was the story. Look at this post. Then back at this one. Then at that post again. Then back at this one. (Sorry. Too much of this.) You should see what I’m talking about. We didn’t really game to win – even if that was an aspect of the game as well – but mainly to have a fun game. We managed to tell a story and to turn a load of old terrain and a bunch of miniatures into something entirely different. There were almost no rules arguments, we simply went with what seemed suitable for the scenario and the situation at hand. Rules were bent, adapted and made up to suit the scenarios. The most important things, fun and flavour were never left behind. What more can I say? This, to me, was perfect miniature gaming. Interesting battle report. I’m curious, though. How much of special scenario rules did you think of before hand, and how much was ruled on the spot? Just from reading the story, it seems to me (from a miniature wargamer’s perspective) that the rules are quite convoluted, taking into account things like slipping on wet grass and whatnot. Actually most of the details are simply narrative embellishes. Regarding the slipping example, it had been defined (by the rules) that it was raining, and the hunter recoiled from an attack, receiving a knocked down result. Naturally it translated into him slipping and falling down because of that. Much more fun than a “recoils, knocked down” result, even if it’s exactly the same thing. actually Navdi, Fear and Faith’s ruleset is almost the very image of simplicity. The basic mechanics are in fact so simple that this allows the game to detail other aspects, such as staking, silver bullets, magic, metamorphosis, demon-summoning, etc… the list is too long. My blowing of Fear and Faith’s trumpet made me forget to say that the report was great! Where did you get the house templates and what brand is the werewolf? The houses are WHFB stuff, from the 5th edition box set if I’m not wrong. The grey shed was a free download from one site or the other, can’t for the life of me remember – it’s probably 6-7 years old.